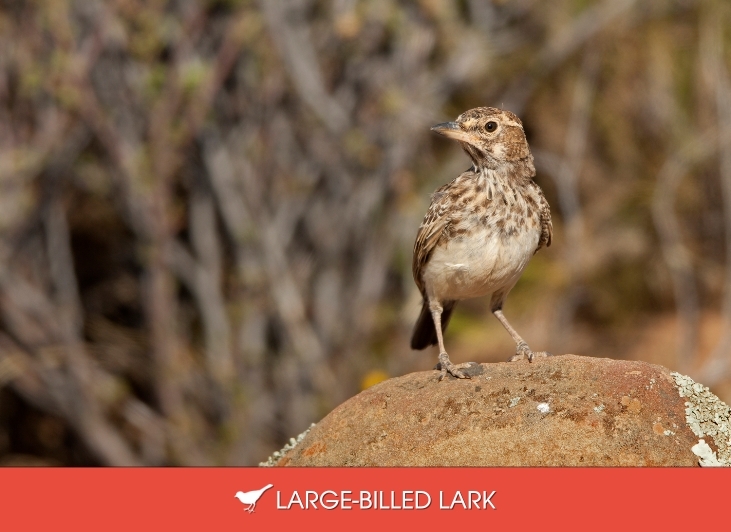 This lark has a stocky appearance and a thick, heavy bill with a yellow base. It is boldly streaked on the back and chest and has a slight crest which is raised when the bird is alarmed or sings. Both sexes are alike. It is a fairly common in the region, found in semi-arid grasslands, shrublands and fallow fields. Its food consists of insects, seeds and bulbs. It is monogamous and builds a cup shaped nest which is well concealed below grass tufts or low shrubs. 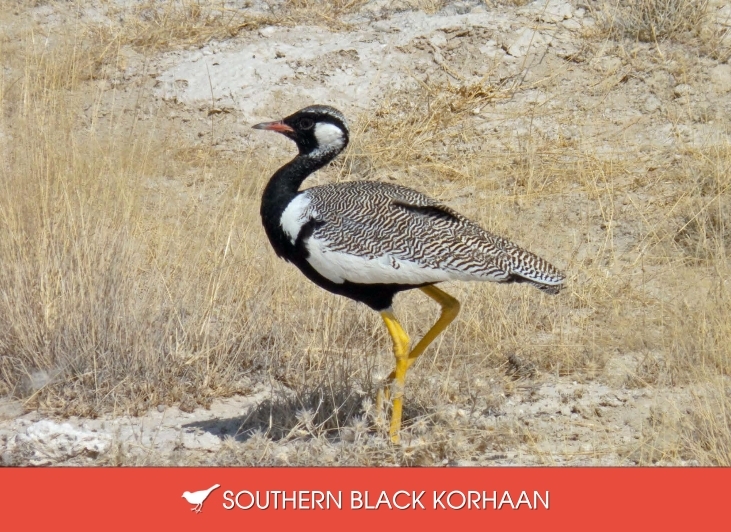 The Southern Black Korhaan is sedentary and often found singly in its preferred habitat which is Renosterveld, fynbos and Succulent Karoo. It is becoming scarce in the Swartland area because very few patches of Renosterveld remain. It feeds on insects, small reptiles and plant material such as seeds and green shoots. It has a harsh, raucous call and can often be seen standing on small termite mounds whilst calling. The femaleis plain, and has barred upperparts and back. Distinguishing features of these birds are the red base to the bill, bright yellow legs and black primaries visible in flight. 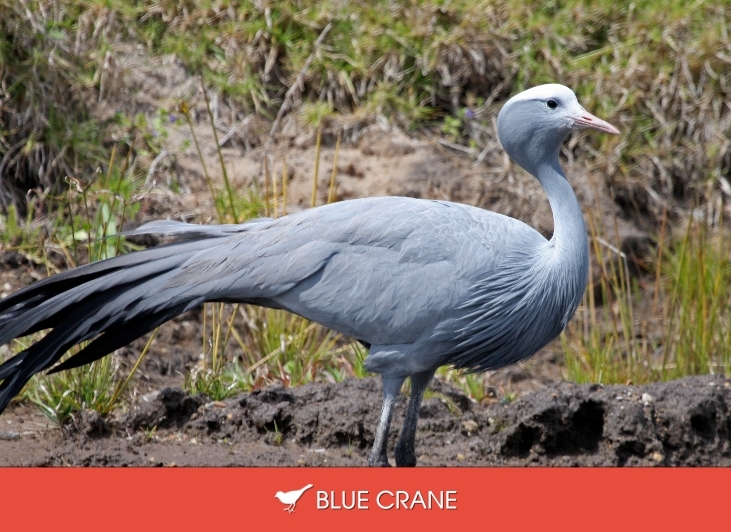 The Blue Crane is the national bird of South Africa and also appears on the 5c coin. An elegant bird with long inner-wing feathers which show as “tail” feathers extending almost to the ground. Both sexes are alike. Out of breeding season (Sept- December) huge flocks of up to 1 000 birds can be seen. The habitat of the blue crane is mostly natural grassland but also wetlands, cultivated fields and croplands. It eats a variety of foods, mostly vegetarian but which includes small bulbs, seeds and roots, caterpillars, grasshoppers, termites. An unmistakeable bird with black plumage, white rump and barred black and white tail. 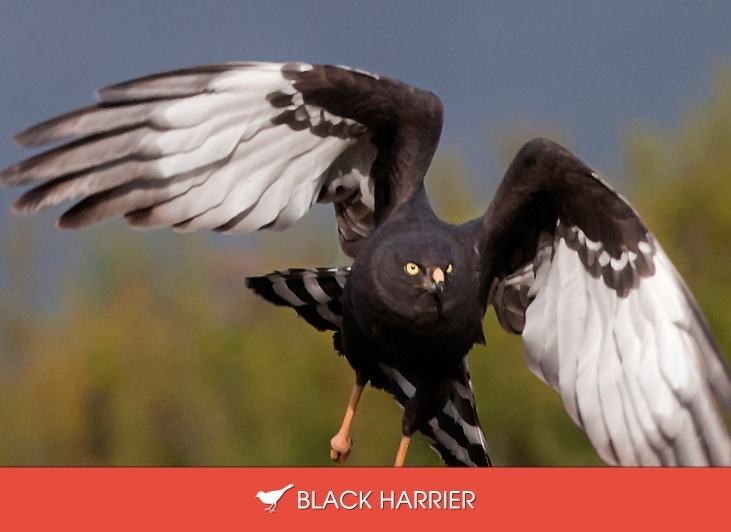 The Black Harrier is an uncommon bird, listed as vulnerable. It is found in Renosterveld, Fynbos, Karoo shrublands, dry grasslands and croplands. Its food is predominantly mice and small birds, and it will also take reptiles,frogs and insects as prey. Usually monogamous, it’s nest is a shallow platform nest placed on the ground hidden in vegetation. 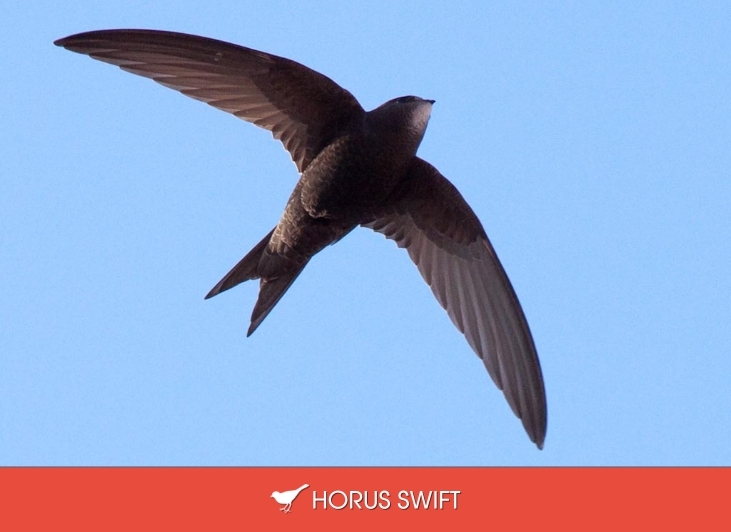 The Horus Swift is a stocky, black swift with forked tail and broad white rump. It is an uncommon resident and breeding visitor and usually found in groups of 2 – 6 birds. Found in a wide range of habitats, often close to their breeding sites, and feeds on aerial arthropods. The Horus Swift breeds in tunnels excavated by other bird species in vertical banks. 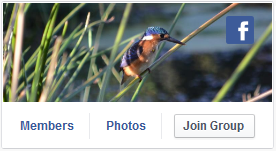 A good place to see these birds is along the Riebeeks River Road. This is a small plover with a narrow chestnut breast band. Males have a black forecrown and eye-stripe which turn brown when not breeding. The females lack the black facial markings and chestnut lures. It is an uncommon to rare resident; and is also nomadic in response to water levels. 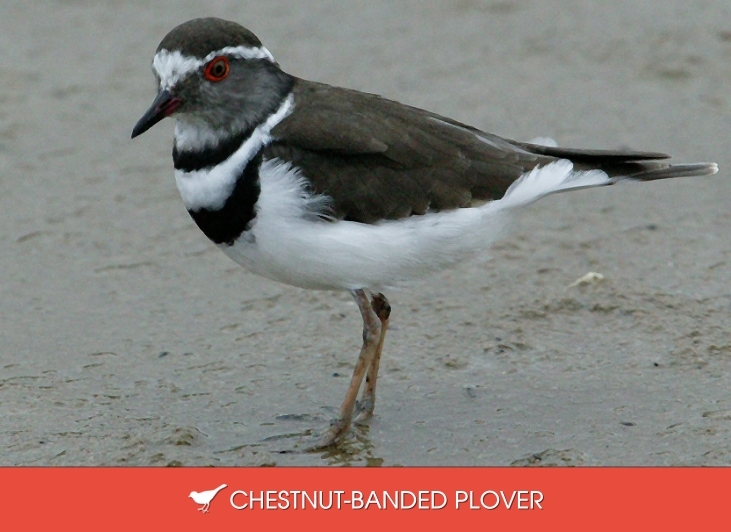 The Chestnut-banded Plover’s habitat is natural and man-made saltpans and it feeds on insects and crustaceans. It is regarded as Near-threatened. Monogamous, its nest is a shallow scrape in the sand, and it performs a “broken wing” act when its nest or chicks are threatened. The sexes are alike, although the female is larger than the male and has a longer bill. 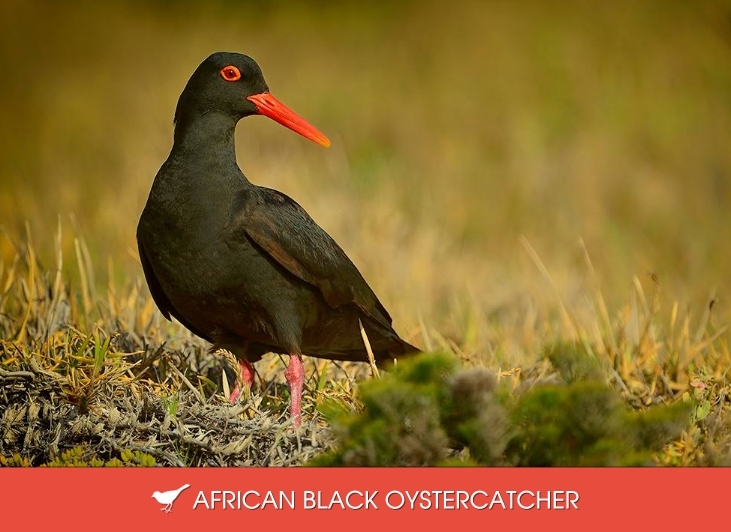 It is a large, black wader with a red bill, red legs and a red eye-ring. It is a locally common resident and favours rocky shores where it can be seen searching for limpets, mussels and crustaceans. It is monogamous, with a nest scrape close to rock or kelp. It is regarded as Near-threatened.